This report describes the first stage of the age validation process of Italian supercentenarians. The process is still in progress and to date has only concerned supercentenarians deceased in the period 1969-2000. Of 35 potential supercentenarians included in the Italian National Institute of Statistics (Istituto nazionale di statistica, or Istat) database, 21 cases (three males and 18 females) are fully validated, seven cases refer to false supercentenarians—the error often being a misreported date of birth—and seven cases still remain unverified. 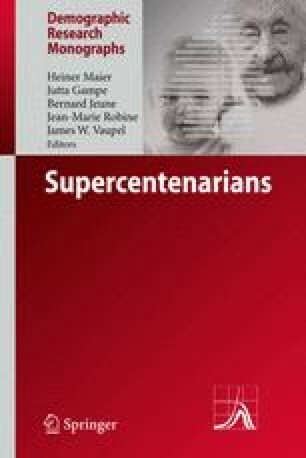 The maximum age reached by the validated supercentenarians is 111, and the first case is recorded in 1973. In Italy supercentenarians have become a significant phenomenon only in the last few years. ISTAT (2003). Popolazione residente al censimento 2001 per et, sesso e stato civile. www.demo.istat.it.